It’s not a Texas or a California market. It’s not in the Pacific Northwest or Mountain West. It’s not even the largest city in Florida. Orlando is commonly known for its theme parks and tourist spots, but in the past year, this has been one of the key markets to watch for apartment market activity. Riding the waves of population growth and economic strength, apartment fundamentals in Central Florida continue to impress, as this metro maintained the nation’s top rent growth standing and hit a 20-year occupancy high in June. Orlando assumed the rent growth thrown in early 2018 and has retained the top spot since. In the year-ending 2nd quarter, the metro logged a price increase of 6.5%, solidifying the market’s continued reign atop the nation’s 50 largest metros. Price hikes are nothing new in Orlando, which averaged annual rent growth of 4.2% during the current cycle. In total, average rents have increased 36.8% throughout the nearly eight years of the cycle. By comparison, apartment rents in the U.S. overall rose 31.6% since the end of 2009. 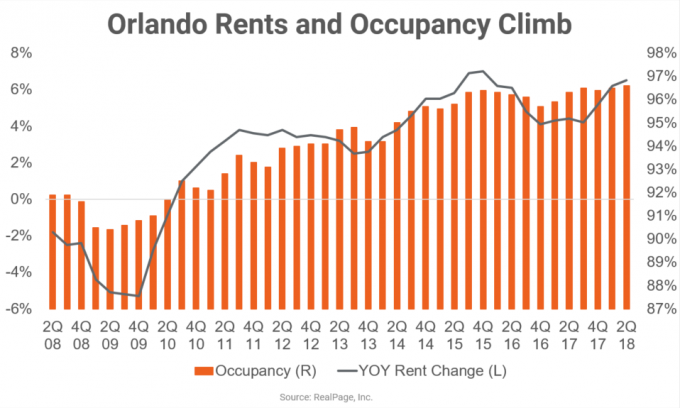 Even with sustained rent growth, occupancy in Orlando’s apartment stock climbed to 96.6% in June 2018, the metro’s tightest showing in at least 20 years. Among the nation’s biggest markets, Orlando ranked #6 for occupancy in 2nd quarter, behind Minneapolis, Providence, San Francisco, New York and Newark. 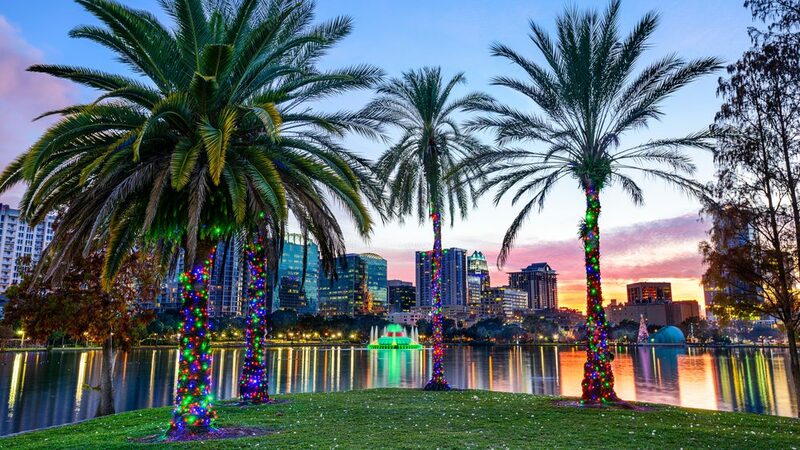 Orlando’s June occupancy reading was 580 basis points (bps) ahead of the late 2009 showing before the cycle began and nearly 200 bps above the national average in mid-2018. Among the nation’s top five annual rent growth performers, Orlando recorded the best occupancy showing in 2nd quarter, the best average occupancy throughout the course of the cycle, and was topped only by Phoenix for the best occupancy (and rent) growth during the cycle. Driving occupancy health in Orlando was the metro’s Class C product. This lower-end stock climbed about 1,200 bps during the cycle to land at a very tight 98.9% in June. While the pricier product lines also did relatively well, the performances there were not quite as impressive, largely because those upper and middle tiers see didn’t occupancy fall as much during the recession. Class B stock climbed a total of 460 bps to stand at 96.2% in June, while the quickly growing base of Class A projects increased 240 bps to reach 95.4% in 2nd quarter. While Class C product drove occupancy improvement, it was the metro’s upper-tier product that drove rent performance. Rents in Class A apartments jumped 7.2% in the past year, above the cycle average of 5.3%. Overall, rents in that segment have grown 57.2% since 2009. Apartment occupancy and rent performances in Orlando have held up despite significant construction activity. During the year-ending June, this metro added 7,769 new units, the market’s largest volume of apartment deliveries in 16 years. During the current cycle, Orlando has gained an average of 4,033 units annually, increasing the base an average of 1.8% per year. Except for a brief lull in the last half of 2016 and early 2017, Orlando has had very few problems absorbing all that new stock. Demand for apartments came in just ahead of new supply in the year-ending June at 7,976 units. 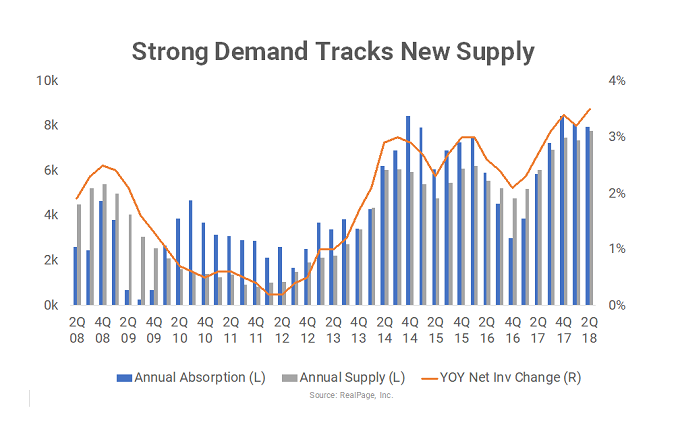 During the cycle, demand has averaged at 4,978 units annually, coming in well ahead of average supply volumes. Solid population increases and economic gains have created demand for all types of housing in Central Florida in the past few years. According to the U.S. Census Bureau, Orlando’s population grew by more than 56,000 residents in 2017, swelling the metro’s existing population by 2.3%, more than twice the national average. This was the fourth consecutive year of resident increases between about 55,000 and 60,000 people in metro Orlando. Economic gains have also been solid in Orlando, with annual job growth registering at 40,000 jobs or greater every month since November. Employment increases have been especially strong in the key Leisure/Hospitality segment, powered by the metro’s dominant tourism industry. Unemployment in Orlando fell to just 3.0% in May, the smallest figure this market has enjoyed since before the Great Recession.